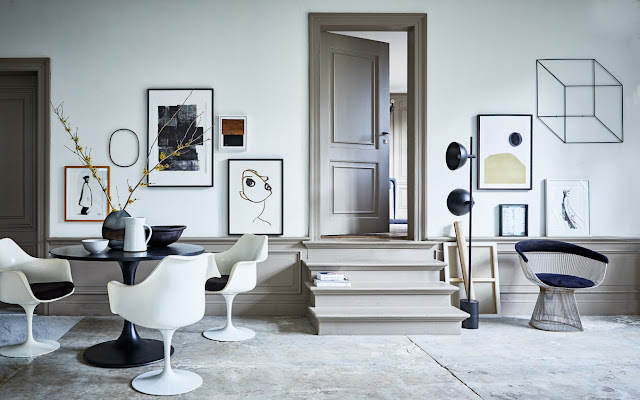 Cleo Scheulderman for Dutch interior mag VT wonen with photos by Jeroen van der Spek Saarinen Tulip chairs around the table and a Warren Plattner chair accompanies the art chosen for the open plan living room. If the 2018 tendency lecture called It´s all about art + (Artists) by trend analyst Cay Bond was a home, this is how it could look in my way of interpreting Cay´s sign of the times. 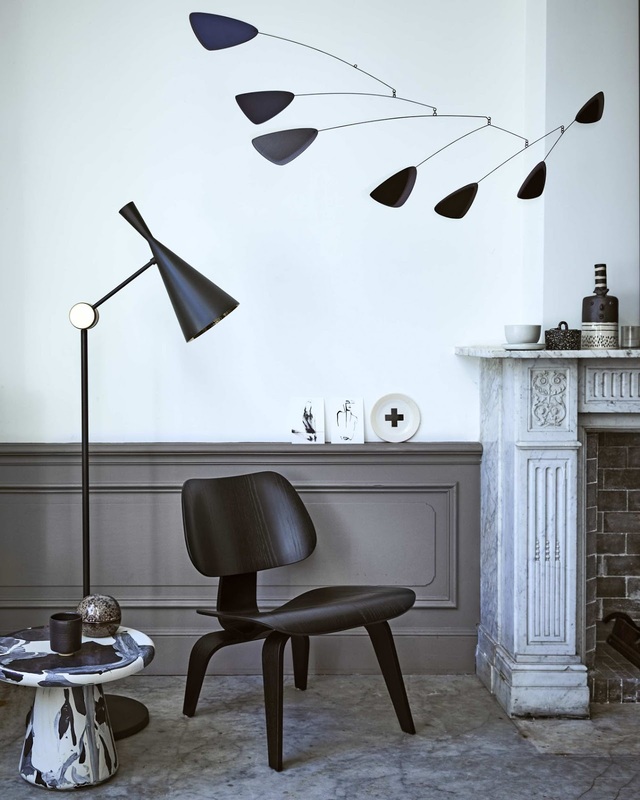 Stylist Cleo Scheulderman for Dutch interior mag VT wonen with photos by Jeroen van der Spek A Eames chair and a Tom Dixon floor lamp with the mobile from Volta and a table from Marga Janssen. Stylist Cleo Scheulderman for Dutch interior mag VT wonen with photos by Jeroen van der Spek Acrylic on linen, Laura de Wilde. Sofa from Linteloo. Wire Basket, Goeds. Right next to Rossana Orlandi in Milano during the design week Sé is presenting the new collection IV created by designer Ini Archibong. I meet Ini right inside the door and he gives me a warm greeting and a generous tour of the furniture&ligthing collection created for Sé together with co-founder Pavlo Schatkleff. 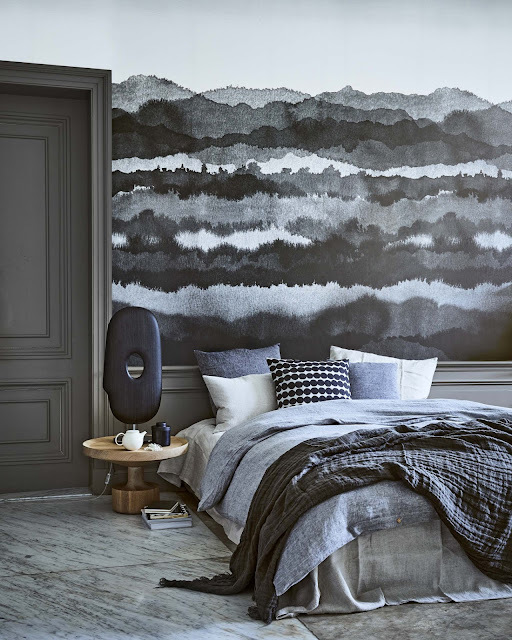 Ini has taken his inspiration for "Below the Heavens" from ideas of cosmology, the classical world and celestial harmony. The result is a more down to earth collection of 11 objects than expected of which I show you my photos below. The Eos Table is a cantilevered disc atop ceramic or lacquered base: akin to the sun rising over a horizon. "I wanted a top and base to interact like concentric ovals, giving a feeling of perpetual motion," says Ini. The Circle chair has a playful personality. With a deep upholstered seat and harp-like back, "It provides character as well as comfort" says Ini. Collection IV took shape after Sé co-founder Pavlo Schatkleff approached Ini Archibong. Sensing that they shared values, Schtakleff and Archibong embarked on a design journey, visiting Sé's European manufacturers and developing their mutual sensibilities of the sumptuous and sculptural, merging fine materials - marble, brass and handmade glass. "Our DNA matched", says Ini Archibong talking about his relationship with Sé co-founder Pavlo Schtakleff creating the "Below the Heavens" collection. "We spoke the same language"
One flight down the only light provided is coming from the 12 crystal lamps in the Moirai Chandelier , described by Ini as a "constellation of clouds" Created by the glass technique of cold-working, it has three main families of shade, which can be combined in different configurations. With brass stem mounts they make for an illuminating conversation. Thank you Ini Archibong for taking the time to show your Sé collection. Castle hopping is a good way of describing a favorite Sunday activity around Stockholm. What brought us to Mälsåker Slott was my talented piano playing friend Magnus Bergman who had a concert here. We came around to enjoy the Piazzolla concert performed by Magnus and his accordion playing musician friend as well as to see the castle we had not before seen. Seen from the waterfront the baroque castle has a powerful impact. Marcello posing as a statue in one of the not yet restored parts of the castle that I just adore. In rooms not yet renovated at this art loving castle an exhibit of Urban Jörén is hung masterly against the old walls that becomes a perfect combo with the black&white photos set against the worn&wonderful walls. Look up to see all the amazing ceiling stucco of this baroque castle. Lake Mälaren reaches the castle and in this heatwave a swim seems like a good idea. Fireplaces to be inspired by. Wandering around in this castle is like traveling in time. If you are interested in reading more about the history of this mansion from the 1400´s to how it turned into a castle you find more here. The castle is cared for by a nonprofit organisation that I just became a member of. You find more about that here.